The United Nations General Assembly has voted by a huge majority to declare a unilateral US recognition of Jerusalem as Israel’s capital “null and void”. At an emergency session of the General Assembly on Thursday, 128 countries voted in favour of a resolution rejecting US President Donald Trump’s controversial decision on December 6. Nine countries voted against, while 35 abstained. Trump had earlier threatened to cut aid to UN members who would vote against his decision. After the naked modern-day colonialism, which is being implemented by Australia, New Zealand, and France, and, of course, by the United States, have the people of Polynesia, Melanesia and Micronesia become blind? The answer to all these question is, actually: “No”. When working on my book, Oceania, travelling all over the South Pacific, I visited a Jesuit priest and the region’s prominent intellectual, Francis X. Hezel. Our encounter took place in the capital of the Federated States of Micronesia (FSM) – Pohnpei. Life here became shorter, and much worse than under the Japanese imperial rule. And this was not some ‘Communist propaganda’. It is written right here, in the report produced during that period by the US Department of State. Pacific Island votes at the UN are openly for sale, especially when peace in the Middle East is at stake. To illustrate the absurdity of the game: at a time when several countries in the region are becoming uninhabitable as a result of global warming, both Nauru and Kiribati, itself one of the sinking nations and therefore a victim, voted against the Kyoto Protocol. But it is not only profit that propels tiny nations in Oceania to sell their votes; it is also the fear of retribution. In December 2017, out of the nine countries that voted against the UN resolution, one was the United States itself, while the other eight were: Guatemala, Honduras, Israel, Marshall Islands, FSM, Nauru, Palau, and Togo. Two were de facto US semi-colonies in Latin America, ruled by brutal pro-Washington cliques, one a tiny and dependent African nation, while four were the Micronesian and Polynesian nations and, of course, Israel. Presently, six countries of Oceania have fully established diplomatic relations with Taiwan, after being, as was described to me by the former Foreign Minister of RMI, Tony deBrum, “encouraged” by the West. 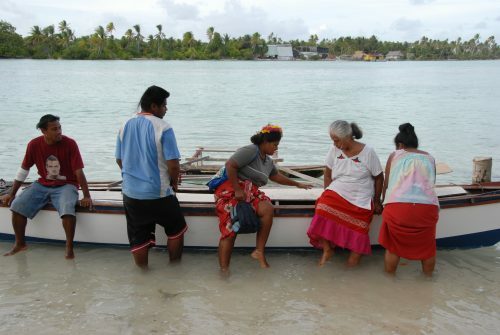 At least three of them – Tuvalu, Marshall Islands and Kiribati – are at the frontline of the climate change disaster: they are becoming uninhabitable due to the global warming and consequent rising of sea level. 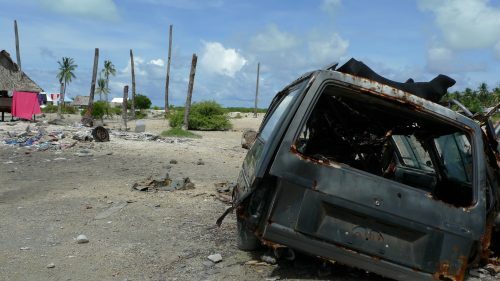 China is the only country that has been willing to, altruistically, help the countries of Oceania: by building anti-tsunami walls, by planting mangroves, by elevating schools, hospitals and government buildings, or by building sports facilities in places where around 90% of adults is suffering from diabetes, often due to dumping there some of the most unhealthy food from the US, Australia and elsewhere. After China leaves, the countries of Oceania can only rely on the pathetic, cynical and hypocritical “foreign aid” offered by the West, while their corrupt leaders negotiate with New Zealand and Australia the final ‘evacuation project’. 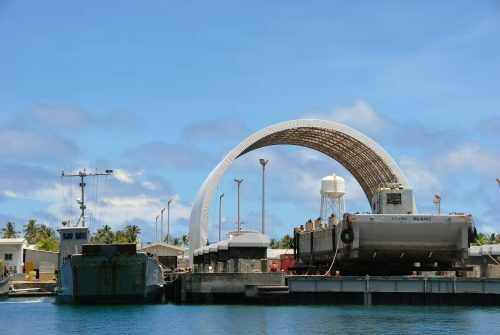 Entire countries like Tuvalu may soon be forced to move abroad. The selling of votes by South Pacific Island nations appears to be shameful, but, in fact, it is nothing else than an act of total desperation. The Empire has reached great mastery in implementing the “divide and rule” strategy. 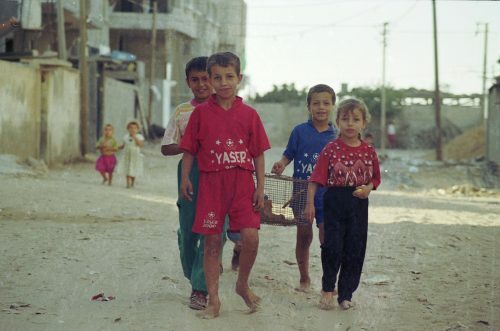 Palestinians are involuntarily living in a cage. People of Oceania, who used to be the greatest seamen, are surrounded by the vastest expanse of water on Earth, but in the same time they are confined to tiny specks of land, often scarred by Western military bases. Trash and decay are everywhere. Hopelessness rules. Oceania knows almost nothing about ‘modern Palestine’. Palestinians know almost nothing about Oceania. Empire looks dumb but it is not. It is ‘only’ evil. It knows everything about both parts of the world. And it is torturing them relentlessly and with perverse sadistic delight. This article was posted on Friday, January 19th, 2018 at 8:35pm and is filed under "The West", China, Empire, Environment, Global Warming, Guatemala, Honduras, Israel/Palestine, Marshall lslands, Micronesia, Oceania, Solomon Islands, Taiwan, United Nations, United States.